Today’s post is about the products that I purchased at Marshalls not too long ago. You can definitely stumbled upon some hidden gems if you’re lucky enough. If you’ve never tried Zoë Ayla Beauty before then this place is a great place to start. You’ll definitely end up falling in love with the brand. When I saw this cute Luxurious Fish Style Foundation Brush at the store, I told myself this is the one. Available in five pretty fish shades and my favorite is the rose gold. The overall design is super cute and so elegant to look at. I really like how beautiful and soft these bristles are. This is definitely a hit and the winner in my book. I love it so much! I like to apply my foundation or bb cream with a beauty blender or the Zoë Ayla foundation brush which is compact and super quick to use. It’s amazing how pretty it buffs in my foundation. My go to foundation brush recently has been the Zoë Ayla foundation brush which is super soft buffing brush that doesn’t aggravate my sensitive skin. Need I say more! Grab yours today! Book of Beauty – Brow Know How Powder Palette by Pixi Beauty includes 4 highlighters and 8 brow shades and not tested on animals. I picked this one up because it’s a great price. It’s only marked down for $12.99 at Marshalls which I think is a good steal. A convenient kit that’s travel friendly and a great beauty book for makeup artist. If you’re working on doing makeup for friends on a wedding event, than this would be very handy. You can find brow shades that fits or you can also make your own cocktail shade from these lovely pans. I like to use the highlighter onto my brow bone and the brow shade that I’ve been going back and forth with is this dark taupe on the second right row. A nice shade that I’m comfortable wearing. Just the perfect color for my brows. To be honest, I’m not a huge fan of powder brow because of my sparse brow so I’m quite pleased to see it does a decent job done. You can mix the brow shade to get your best match. There ‘s really no right or wrong shade. Overall, I’m quite impressed by the pigmentation and the looks that I’m able to get from it. The problem is not about the quality of this product but more about my preference for creamy pencil brow but if you’re on the market for some powder brow then you got to try it! Last but not least is this cute brick like Hemp Exfoliating Sponge by Zen New Zealand. Close up look of the product material. I like taking my shower with body wash with a good sponge scrub so this stuff is right up my alley. I particularly like using it during the summer time. The reason why I like to use this stuff over the summer time is because it gives my skin that nice exfoliation my body desires. I guarantee you’ll feel and see an instant results after getting out of the shower! Inside was made of a squishy sponge while enveloped by natural hemp strings. I notice the texture to be really nice and comfortable. It’s not too rough or hard for the body which I really appreciate. I found so many awesome brands at my local Marshalls. I HIGHLY recommend you check out your local store and see what products they’ve because you can definitely save some money! Let me know if you’ve tried any of these products out! I love that makeup brush. it would look so pretty in my bathroom. I love that little copper colored fishy brush! I want one of my own. Plus that PIXIE collection is so cute, in addition to using it for my brows I would absolutely use the lighter colors as eyeshadow. I love that fish brush! Rosegold is my favorite color, too. Everything looks awesome! I like that fish brush. That brow powder looks fabulous as well. Um I need all these products! That fish brush is so rad!! Love the palette a lot! That is such a fun and interesting brush! I’m definitely going to see if I can find it. Also those brow pigmentations look amazing! Such goodies you got from Marshall! They are definitely a hit! I absolutely love the fish style foundation brush; it’s no doubt a luxury brush lol! 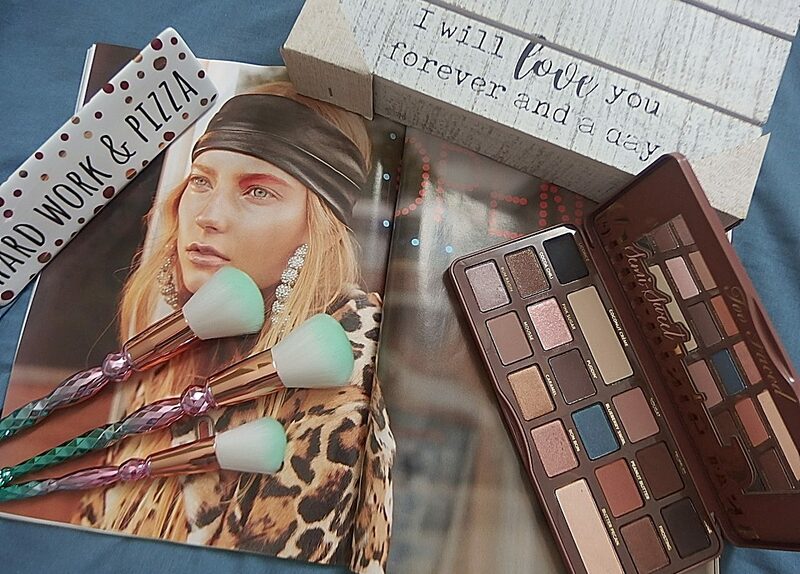 The palette looks good and the shades are great. And, when it comes to scrubbing, I prefer to use loofah over anything else. Those are some great products. Totally loving the fish brush, looks like a mermaid tail too. The palette looks great too. Book of Beauty? Wow, I need this. When it comes to make up, it’s always a miss for me. That fish style make up brush is really nice. Everything looks awesome! Everybody is so obsessed with Pixi beauty, it always makes me question if it is worth the hype! The palette looks gorgeous though!